When I was growing up, one of the most profound things that I remember about my mother was her joy of giving. She did homemade gifts and baked goods for friends and family, but also gave her time unselfishly to help others. I’d like to think it’s in my genes too as I find great joy in giving as well. November is my birthday month and I can’t think of anything I’d love better than giving presents to others. So, starting this week and the weeks to follow in my birthday month, I’ll be making projects that will be part of giveaways, so stay tuned on my blog and Facebook page for more details on how to enter each week. 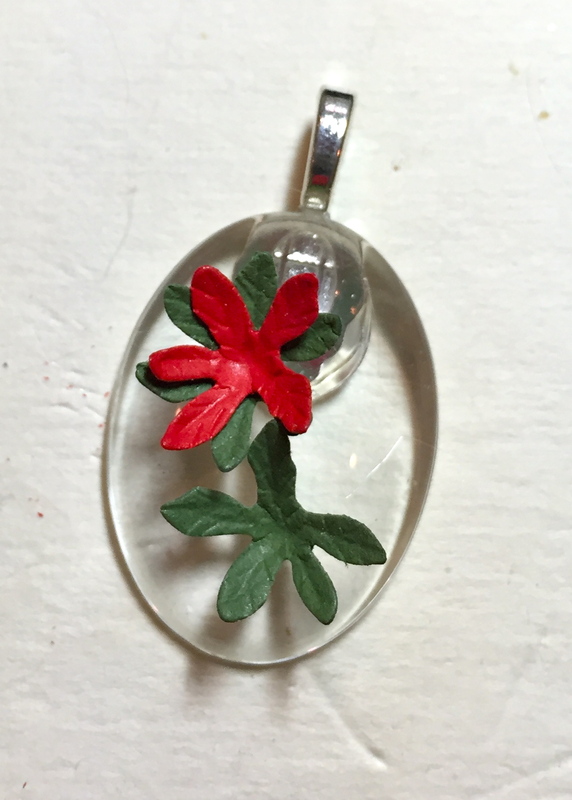 This week I’ve done a Poinsettia, from CountryScapes – Backyard 4 (1079), on a glass cabochon. It’s sealed with Ice Resin, which gives the paper flower a porcelain-like finish. The poinsettia cabochon will come in a gift box with my Garden Notes Poinsettia (1090) on a slip-off band. Aren’t presents fun?! 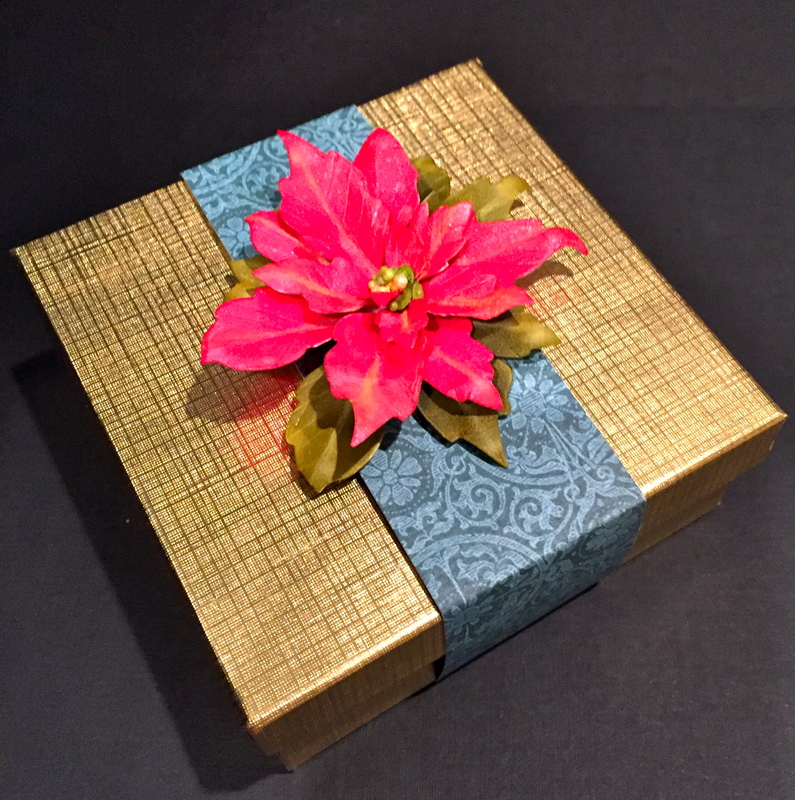 For this week’s giveaway, I will be sending the lucky winner the Poinsettia cabochon from today’s post in a gift box that is decorated with my Garden Notes Poinsettia (1090) on a slip-off band. 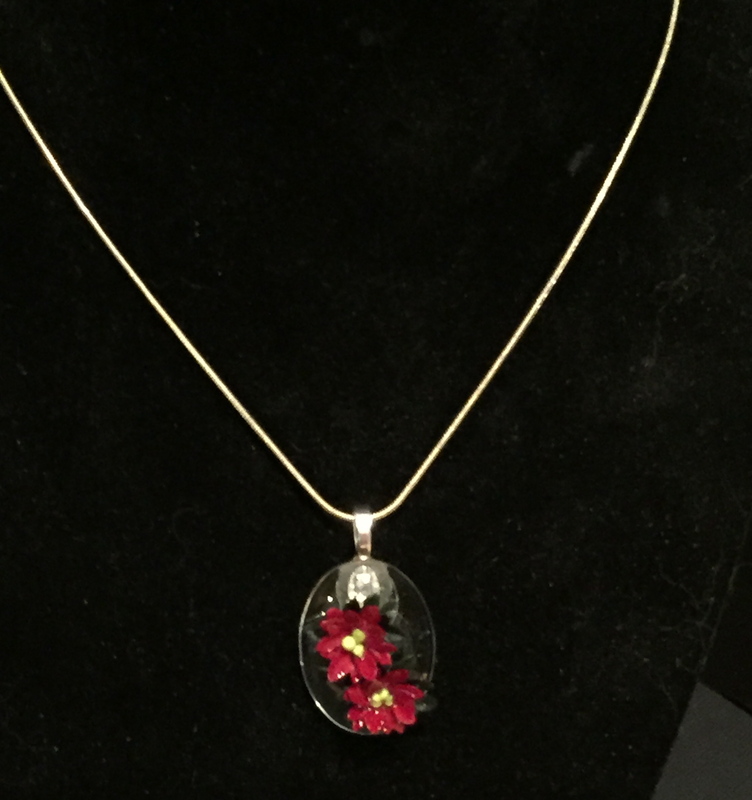 In addition, Elizabeth Craft Designs is also getting in on the ‘giving’ and you will receive a die to recreate a mini flower cabochon necklace of your own! You can choose from 1 of the 4 dies I’ve used to create the necklaces. In order to enter, comment on this post – ‘who you would give this gift to and why’. The winner will be announced on Saturday, November 7th. 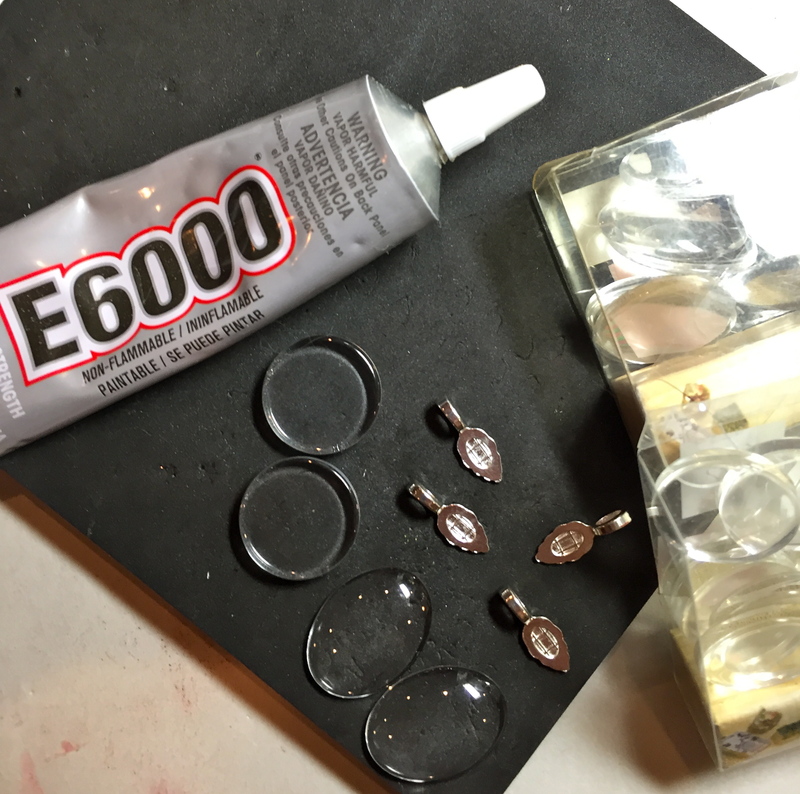 I purchased the glass cabochon tiles and sterling silver bails from the jewelry department of a craft store. 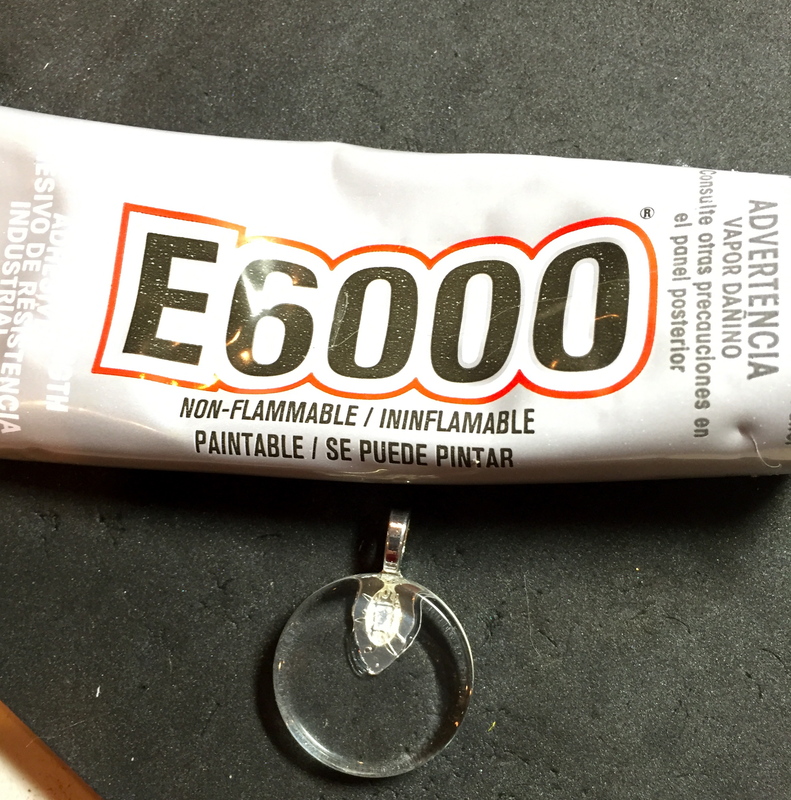 You can also find the industrial strength adhesive – E6000, which you will need to glue the bail to the cabochon. Die cut poinsettia from your favorite 80lb cardstock. I used red; 4 in red and 2 in a medium green. 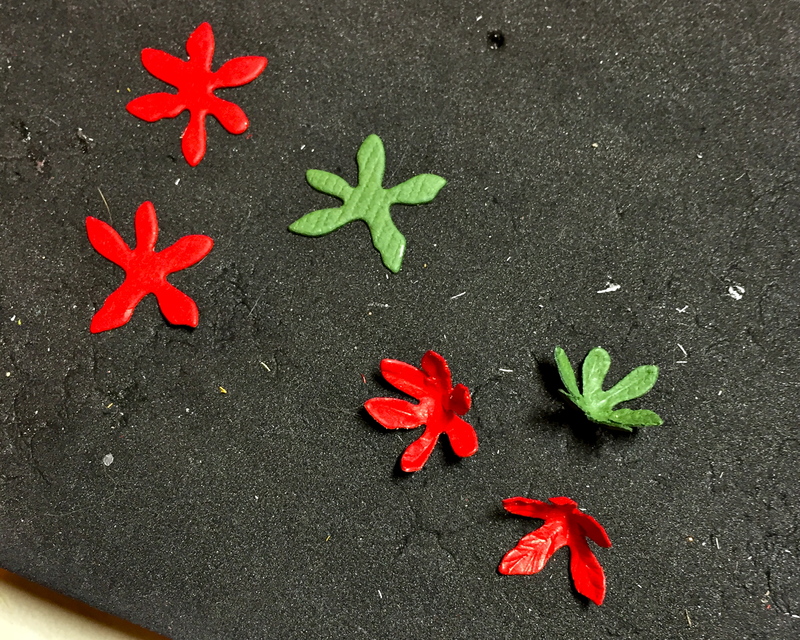 Die cut the separate petals twice in red and once in green. 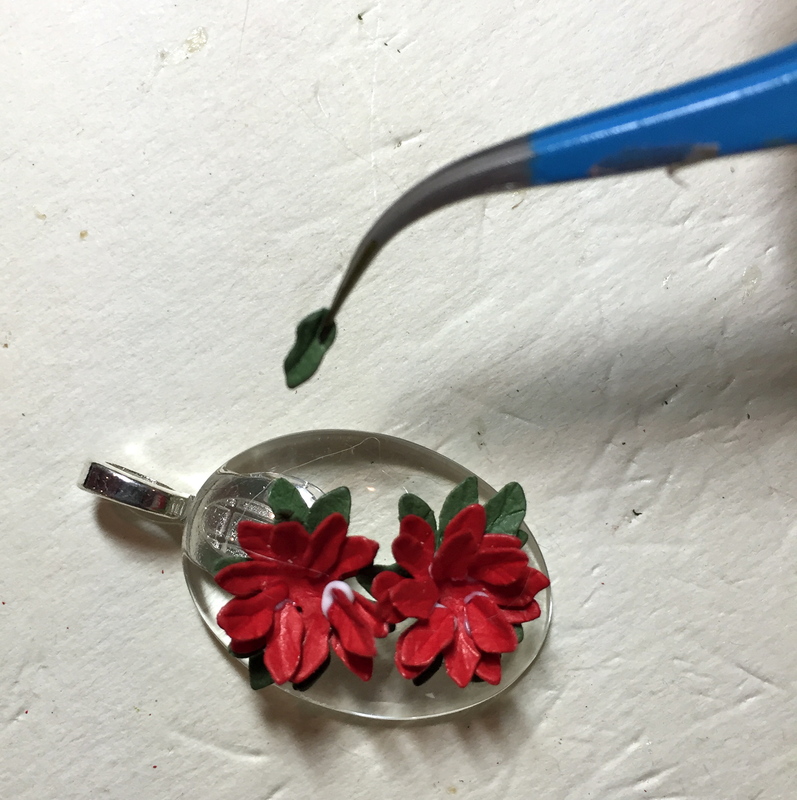 Assemble poinsettia directly on the cabochon using Beacon’s Kids Choice glue. Add several USArtQuest Prills in “Ribbit” to the center for a natural looking flower. 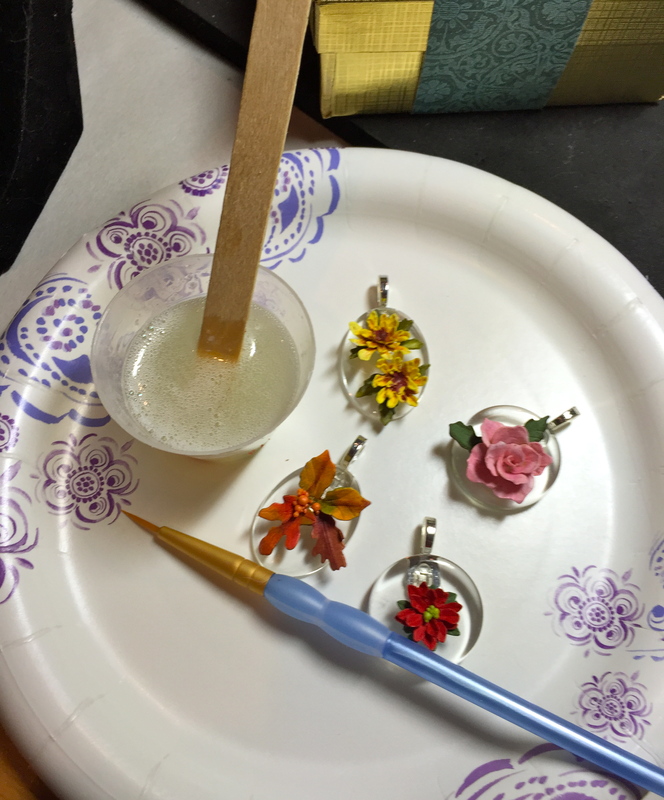 Allow flowers/leaves to dry completely on the cabochons before painting on the Ice Resin. 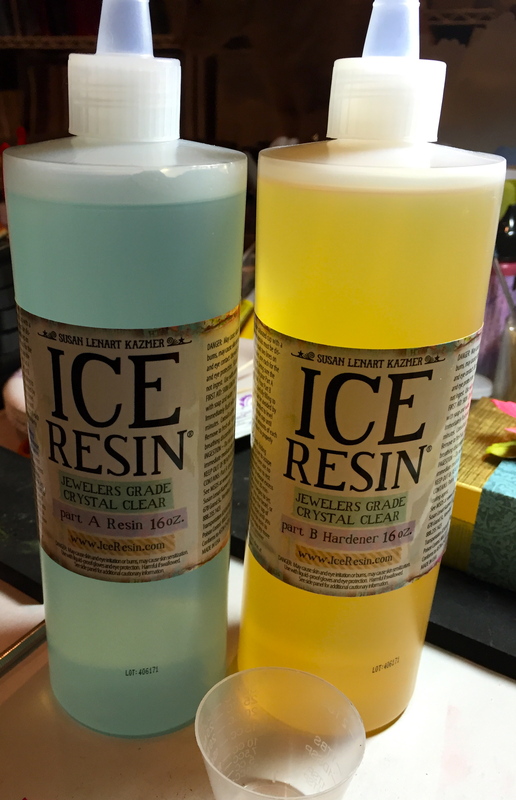 Mix the Ice Resin, according to manufacture’s instructions – 1:1 of Part A & B. Stir for five minutes to activate the resin. 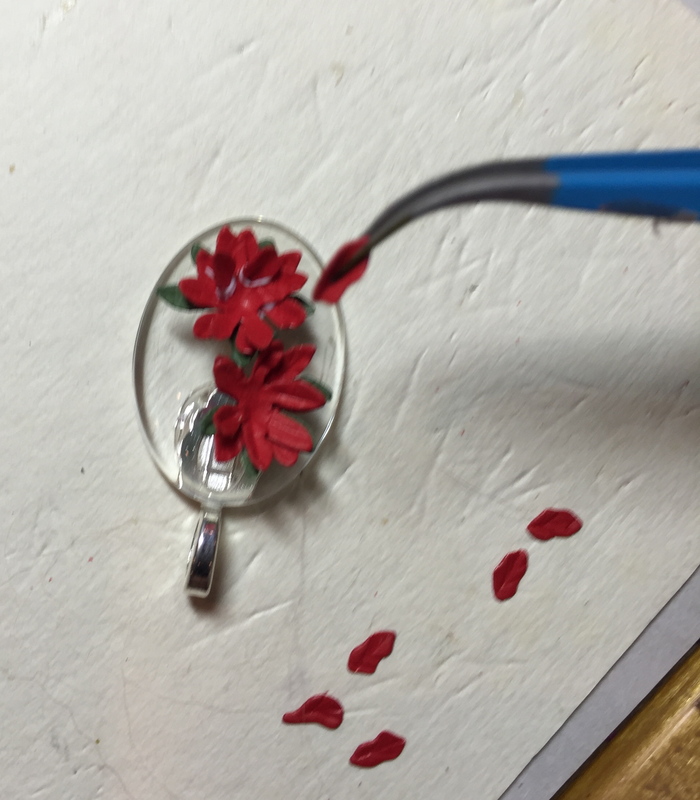 Use a tiny paint brush to apply the resin to the flower pieces. Make sure you don’t “gob” it up, but rather thinly apply it to underneath as well as on top. It takes 48-72 hours for Ice Resin to set completely. 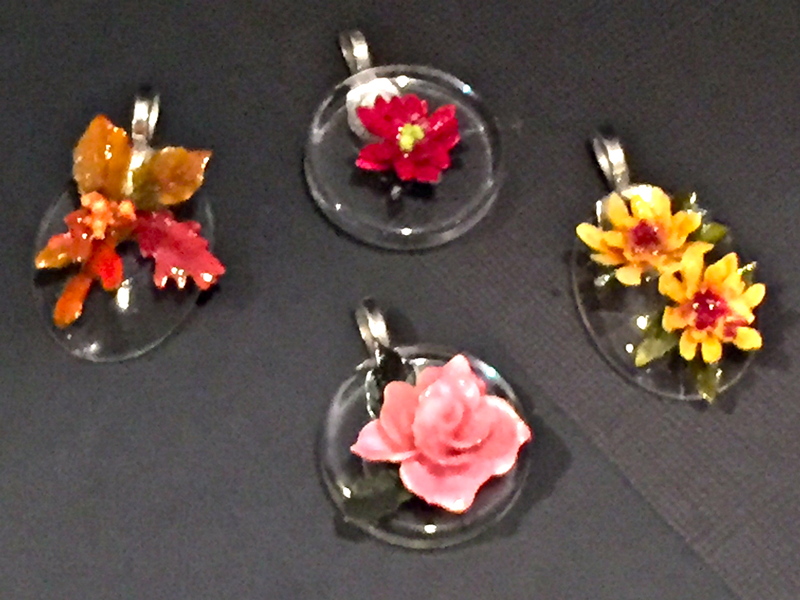 These cabochons would make great gifts for the holidays; I’ve done a few more from my mini-flower collections – leaves, chrysanthemum, and rose. Getting ready for the holidays, these would make great gifts to give! If I was to win this weeks gift, I would give it with joy and gladness to a dear friend in South Florida that loves Poinsettias. She doesn’t think it is Christmas without a house full of poinsettias. She makes sure everyone in her church buys one in honour or a family member or friend at Christmas time for the large tree display she had had created like a tree. She has just gone through extensivie radiation treatment and is doing extremely well. I went and kept her husband who is blind while she under went the treatment. I have jolingly referred to her as the Poinsettia Lady. I know exactly how she feels–good luck! How lovely! What a precious gift! I appreciate her and to encourage her. Sounds like you’re a “giver” too! I would give this to my Mom because she is the most special person in my life.At 92 she is still feisty and independent as ever. I lost my mother when she was only 67 years old; I know how important your mom is to you. Good luck. If my mom were still with me I would give it to her. 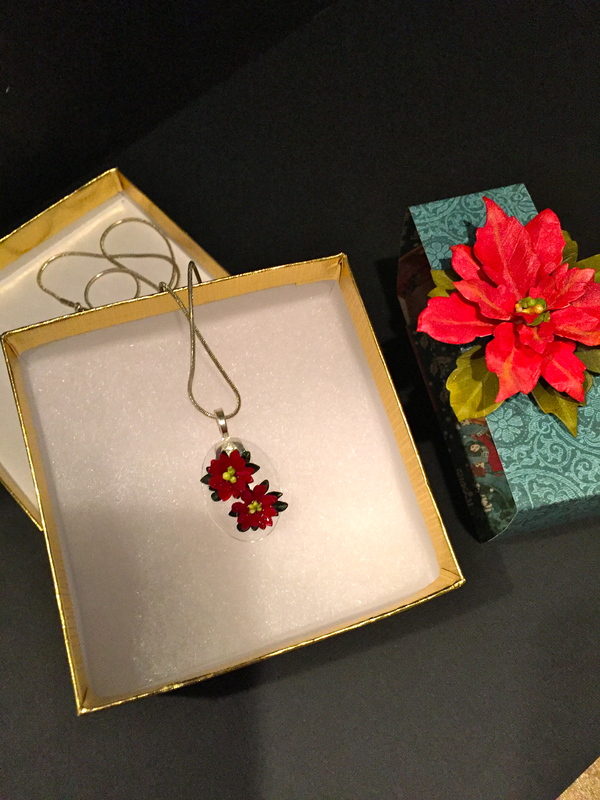 She loved Christmas and would have cherished the pendant. I know exactly how you feel–I’d be making one for my mother too. I would give this to my sister in law because she is one of the most giving people I know and is really having to be a care giver to her very sick mother and could really use a little beauty in her life right now. I too have that feeling of joy each time I give. This feeling is especially intensified when I’m able to give back to my mother who has taught me selflessness in the first place. It’s a great feeling and i feel the same about my mother. Only wish she was still with us. Good luck! Happy Birthday Month! I really enjoy reading your post – I feel like we’re friends. Thanks for sharing some intimate parts of yourself. As for me, I am a stay-at-home mom to a 22 year old young man who has some pretty impacting disabilities. We don’t get out much, but one of the things we do get to do together is his speech therapy. He has been going to the same speech therapist for 18 years now, and she is an amazing person. She is one of the few (along with his mother) who doesn’t give up on him or discount his abilities. Of course, she is the one person I would choose to get this elegant gift. I can’t think of anyone more deserving and I hope you’ll agree! Sounds like a very special person deserving of a special gift. What a lovely necklace! The poinsettia is so petite yet beautiful. I would give this to my 84 year young Mother who loves flowers. My Dad passed away in July, 2013 so my Mother has been adjusting to life without the man she shared her life with for 65 years. She is spending Christmas with my husband and I this year so I would give it to her for Christmas and would get to see her reaction to receiving such a delicate necklace. Thank you for the opportunity to win. It’s so hard to lose parents. Good luck and maybe your mom will be wearing my necklace this holiday. She sounds so deserving. All of these comments have brought tears to my eyes–wish I had time to make about a 100 so everyone could have one! I love there have been so many giving people visiting today. Those are just lovely. It inspires me to be creative and try them myself! Very easy and they make wonderful gifts! Happy Birthday, Susan, and many more. I would give this lovely creation to my dear friend, Beverly. This year, she lost her husband and daughter to cancer. But she is one of the strongest people I know, as she still has a positive attitude and a smile for everyone; she keeps the rest of the family going, too. Happy Birthday to you, Susan! I would give the necklace to my sister. We just went through losing our Mom last month. She was 93. Gorgeous! I would give this cabochon to my sister. She was just “kicked” out of a relationship of 22+ years, & is being so emotionally abused that she is almost suicidal. Something like this might just help her cope. I would give it to my granddaughter. She is the jewelry maker in the family. I would hope that she would make me one with the die that would come with the gift. I love poinsettias. As soon as Thanksgiving is over I start getting my poinsettias for the house. Love seeing them sitting around the house as I don’t put up a tree any more – the flowers bring the idea of Christmas in. Happy Birthday and best wishes for many more. I would give it to my mom, because I love her, and she would love it! I would give this to one of my colleagues at school. She always helps us out and goes the extra mile for us. She loves to wear jewelry and she enjoys dressing up for the season. She also appreciates paper arts and handmade items. She would love this. I just love this, and have done one. I would give this to my good friend Beth, because she has a love for the paper flowers as i do. Happy Birthday month! This is absolutely lovely. I would give this to my twin sister. She is a gardener extraordinare and would be delighted with it. She makes many gifts herself and would love to receive such a handmade gift. Thank you for this opportunity! Love it. My birthday is in Nov. too. I have a friend and her birthday is in Nov. She loves jewelry. I would give it to her. Happy Birthday Susan. I love all the dies I purchased through Elizabeth Craft Designs and Amazon. The Poinsettia cabochon you made is beautiful and if I’m lucky enough to win I would give it to my mother. We had to move her to an assisted living environment recently. I think she would look lovely in it and it would give her a little holiday cheer. She’s the greatest person I’ve ever met and means the world to me. As the saying goes…a mother holds her daughters hand for just a little while; her heart forever. Hope you have a great Birthday. My mother is 90 this year. She made gift as well to give to family and friends. She loves flowers but can not grow them anymore. I also love flowers and making crafts I would give this to my mother. Love hearing about your mom; sounds like. She is a special person. Yes she is. She is in an assisted living now. That is why she can’t have a garden also she is 95% blind. Jaime, sounds like your mom is a wonderful person. Happy Birthday Month!!! your necklace is just gorgeous and the packaging to go with it is a wonderful match up to it!! Thanks for sharing how to make it….. I would have to say I would give it to my sister, she loves flowers and so loves everything I make for her. Susan I would love to see a video for the necklace. I think I will just this on my list of things to make. That is after the new year. That would be an awesome present for my sister. She is always doing or making thing for others, not only i her neighborhood , but also in her church. Thank you for the opportunity. What a great idea putting a mini flower on a cabochon! We both share November birthdays too. I would also give this to my Mom if she were still with me. Her birthday was in December and Christmas was her favorite time of year. She spent all year finding just the right gifts for everyone. I love your book and dies and really enjoy making your flowers. What a great idea to put a mini flower on a cabochon! We both share November birthdays too. I would give this to my Mom if she were still with me. Her birthday was in December and Christmas was her favorite holiday. She spent all year picking out just the right gifts for everyone. I love your book and flower dies and have really enjoyed making your flowers. I would give this nice cabochon to my dear daughter. She has three boys (12,8 and 6) and they all have learning disabilities. On top of that she is working full time as a teacher in kindergarden and is a boy scout monitor. She is my hero. These are just beautiful! If I won I would have to make one for each of my beautiful daughters, my bestie, Jeanine and my 6 granddaughters! Absolutely gorgeous. I would give it to my dear friend in the nursing home to brighten her day. Thank you so much for the opportunity. I love your dies and your creativity.